At one point in my life, I had this dialed down. Now, I'm getting an error and I can't figure out why. I want to open a port (duh). (Yes, my IPV4 is 192.168.0. I went to an open-port-checking site, and it timed out. I thought maybe my firewall was messing with me, so I created two rules, one for TCP and one for UDP. Both are enabled, both are set to allow all connections, all profiles (Domain/Private/Public), for Local and Remote ports. I have specified Port 3567 for all of this - that should be OK, right? (nb: I also tried port 30329, same results). Dan: You're gonna need to get someone to fix my computer. Kim: What's wrong with it? Dan: It's in several pieces on my floor. What service are you trying to port forward to, i.e. 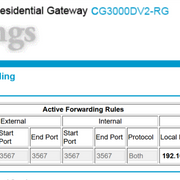 what are you running on port 3567 or 30329? Can you access this service from another machine on the same local network? It's a torrent program. Why would that make a difference on whether or not the port can be seen? (I can't test it on another machine right now, but what's interesting is, if I run my VPN, it passes through the VPN port no prob. Trouble is, the torrent program and the VPN don't play nice). And before everyone gets all worked up, I'm not engaging in piracy! You will need to make sure the ports you are forwarding are also allowed as incoming connections in any firewall software (including Windows Firewall) on the system being forwarded to. No,it is not.please correct that. The 8) got replaced with the sunglasses emoticon. They wrote this in their post:The got replaced with the sunglasses emoticon. 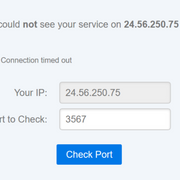 Well I'm about to change my IP to a frowny face if I don't figure this out.